Google has unveiled a new Gmail Labs feature called as Multiple Inboxes that allows users to have more than one inbox in their default Gmail view. 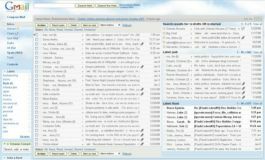 With Multiple Inboxes feature, the users able to have multiple viewing panes in single web browser window. The upgrade gives users a quick view at important labels as well as saved searches. Log in to the main Gmail account and enable Multiple Inboxes in labs. For user who wants to view email from other email account in ‘another’ Inbox, continue with these steps. Log in to the additional account you want to view from your primary Gmail account and open up the settings menu. Go into Forwarding and POP/IMAP and set forwarding to on, and have it send a copy to your primary Gmail address. If you want to add another account into it then you can repeat this step. Go back into the settings menu of your primary Gmail account and open the Multiple Inboxes menu. In each of the panes simply type in “to:” followed by the e-mail address of one of the forwarding accounts. At this point your multiple in-boxes are up and running, but you’re still going to get these messages in your primary in-box too. To keep this from happening we’re going to create a filter. Head back to settings in your main account, then click on filters. Create a new one. In the “to” field enter the e-mail address you’re forwarding from, click next, then pick the “skip the in-box” option. It’s also using any search results as ‘additional’ Inbox, by simply typing a search query into one of the text box of the pane. By default, you should have “is:draft” and “is:star” to display all draft messages and all starred (important) emails on two separate Inboxes.